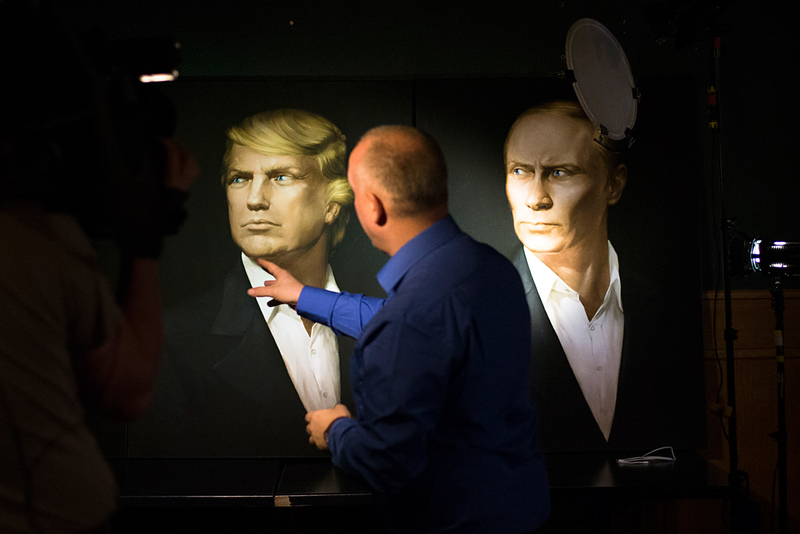 A portrait of U.S. President-elect Donald Trump, with a portrait of Russian President Vladimir Putin during a live telecast of the U.S. presidential election in the Union Jack pub in Moscow, Russia. It looks like Donald Trump and his team don't understand the need and value of America’s role in South Asia. This presents a golden opportunity for Russia to move in, especially since it enjoys good relations with India and Pakistan. Last week’s hearings of Donald Trump’s nominees for posts of secretaries of state and defence, and director of the CIA showed that Russia's stakes in South Asia could grow due to the new White House administration. The hearings showed that South Asia is beyond their focus. Only General Mattis, incoming secretary of defence, made an emphasis on America’s relations with India and Pakistan. However, when talking about Pakistan, he didn’t mention India, and vice versa. He ignored the issues of Kashmir and nuclear juxtaposition in South Asia. Others, including President Trump, didn’t reveal their position on the Kashmir issue and the risk of the nuclear weapons use in South Asia. The new administration leaves the world to wonder, how it will act in response to a highly probable crisis between India and Pakistan over Kashmir and/or cross-border terrorism. Will it have the officials with deep understanding of South Asia like Strobe Talbot in the Clinton administration? Will it be ready to “work behind the scenes to inspire a settlement to the dispute” in Kashmir, in the words of Richard Armitage? Will the new administration be rightly understood, accepted and respected by both India and Pakistan? It’s too early to answer to these questions. However, the recent hearings proved that the Trump’s selections don’t have a focus on South Asia. Russia may just become the sole contender for a mediator role between India and Pakistan. This role was usually occupied by the United States under the administrations of Bill Clinton, George W. Bush, and at to some extent Barack Obama. It looks like Donald Trump and his nominees don't understand the need and value of this role, the history of the U.S. policy in South Asia, and the U.S. instruments in this region. Until now Russia has not mediated well between India and Pakistan. The Soviet record included the famous Tashkent agreement of 1966, but not a lot after that. Vladimir Putin made one attempt to mediate between India and Pakistan, when he invited Atal Bihari Vajpayee and Pervez Musharraf to attend the Conference on Interaction and Confidence Building Measures in Asia in Almaty, Kazakhstan in June 2002. The outcome was discouraging for Moscow. The leaders of India and Pakistan didn’t talk to each other. It’s not the case anymore. Moscow intends to have good political dialogue, trade, and deep military cooperation with both India and Pakistan. It supports the membership of both nations in the Shanghai Cooperation Organization (SCO), which has an ambitious goal to create the Eurasian common security space. Even if Moscow wisely avoids a bid for the mediator role in South Asia, behind the scenes it could facilitate the dialogue between India and Pakistan on bilateral issues. Moscow could offer India and Pakistan the opportunity to explore the fairly successful experience of other members of SCO in the fields of confidence-building measures and resolution of border issues, and if applicable to use this experience bilaterally in South Asia. Russia’s good relations with both India and Pakistan, the probable disengagement of the United States from mediation between these two nations, and absence of other well-balanced and similarly accepted external powers give Moscow a good chance to contribute to peace and stability in South Asia. This would help Russia develop a common security space in the Eurasian region, find a bigger role for SCO in world affairs, and raise its own global stature. This is an abridged version of an article, first published by the Russia&India Report. Views expressed in this article are personal.